A little harsh, but I guess it’s accurate. I wanted to take the time to spend this intro blurb talking about how the show as a whole fares. 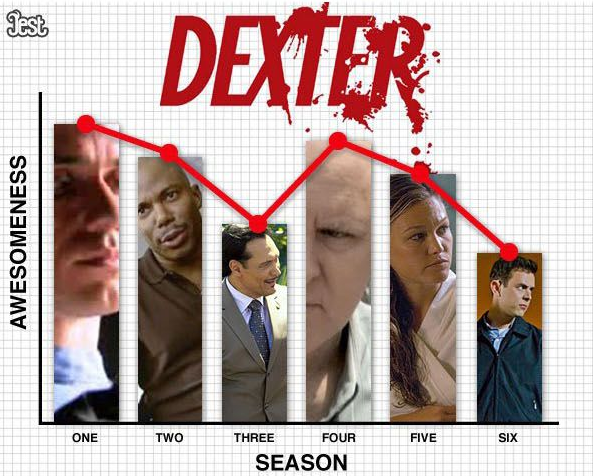 You’ll notice that however accurate the graph above is, it doesn’t include Season 7. I’m obsessed with Dexter, so I’m a little biased. The general opinion I’ve seen online though is that Season 7 is pretty great, which is quite the relief after Season 6. In Season 7, we deal with Deb’s reaction to witnessing Dexter kill Travis Marshall. It’s an emotionally trying season, though nowhere near as much as Seasons 1 or 4 were. I’m only bringing all of this up because Season 8 is playing out to be intriguing all the way through. Read on to learn why. First, a glass of wine. 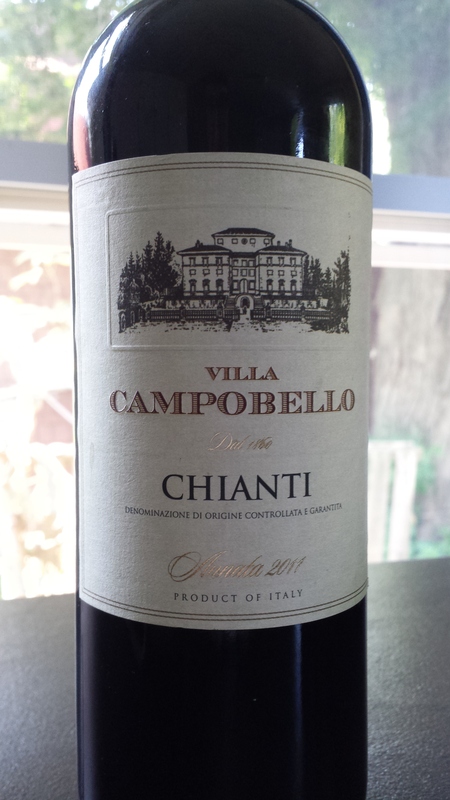 This week, I chose a (kind of cheap) Chianti — a 2011 by Villa Campobello. A Chianti is characterized by its grapes, which come from the Chianti region of Tuscany. Chiantis have also been made famous by Sir Anthony Hopkins in The Silence of the Lambs. This is relevant because we meet a cannibal later on in the episode! Now, for this price (a single-digit dollar amount), the Villa Campobello wasn’t that bad. Not my favorite wine, but still. It was very light and floral for my tastes, but I suppose that makes it a good summer wine. 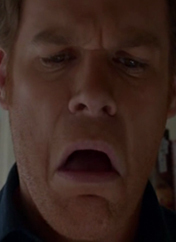 In an only slightly useful scene to the plot, the episode starts out with Dexter waking up in the middle of the night to the sounds of Harrison moaning, “Daddy?”. 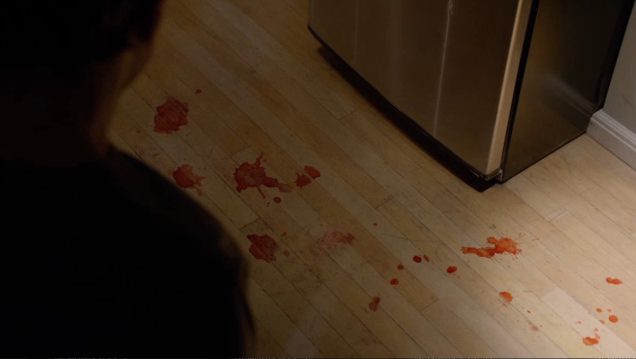 Worried, Dexter runs searching through the house for Harrison and finds, to his horror, a trail of blood leading to the bathroom. In an adorable surprise though, Harrison ate an entire box of strawberry popsicles and made a mess of the house. Harrison was crying because he had a stomach ache, which Dexter cures with some Pepto Bismol. This whole scene is only relevant because Dexter wishes he could help Deb as easily as he helped Harrison. Looks like blood to me! We’ve been witnessing the transformation of Debra Morgan for a long while now. She started out as an undercover prostitute in Vice, moved onto Homicide with the Ice Truck Killer case, made Detective, and then Lieutenant! We’ve seen her grow a lot, which is why it’s been especially sad to see her spiraling decline. As Dexter reminds us in the Previously, “Whoever Deb was before killing LaGuerta, that person is dead.” We first see Deb this episode with a cop tapping on Deb’s car window, where she’s passed out at the wheel. Looks like a DUI, unfortunately. She calls her former fiance, Quinn, at 4:02 in the morning. He’s in bed with his girlfriend Jamie Batista at the time but he has no problem bailing her out. He’s really, truly worried about Deb as he watches her alcoholism escalate. He even goes as far as telling Dexter, even though Deb told him not to. Deb still manages to make it to work hungover and in last night’s clothes where she meets a new client who wants Elway and Deb to determine if her husband is cheating on her. Elway makes her a hangover cure and she starts to readjust, but then Dexter shows up at her office and ruins everything again. He convinces her to have dinner with him and then he’ll never bother her again. Deb opens up to Elway a little bit during the stakeout, but that’s as far as that goes. She grudgingly meets Dexter that evening at a restaurant where she took down a shooter and became a local hero. The man she saved that night is sitting happily with his family at another table, and Dexter tries to show her that she is a good person, despite what she may think. She takes the “good person” mentality a little too far, and dramatically decides that the best course of action is to turn herself in. Drunk, stumbling, and crying she confesses to Quinn, “I killed LaGuerta!” So this is it, the point when Deb finally breaks down. Quinn tries to talk some sense into her, but she keeps confessing until Quinn decides to call Dexter for help. In Dexter’s world, the cops find Lyle Sussman dead at his cabin, but not hanging from a hook as we saw in the last episode. It seems that the Brain Surgeon rearranged the crime scene to make Sussman’s death look like a suicide to keep the cops off of the case. This worries Dr. Vogel even further, as now the cops won’t be keeping the Brain Surgeon at bay. While at home, she gets an anonymous text saying “Look outside.” Wielding what could only be a letter opener, Dr. Vogel opens the door to find two neatly tied boxes labeled “His” and “Hers,” each with an embalmed piece of (presumably) Sussman’s occipital lobe, letting them know that he’s watching them, and now he’s aware of Dexter’s involvement in Dr. Vogel’s case. 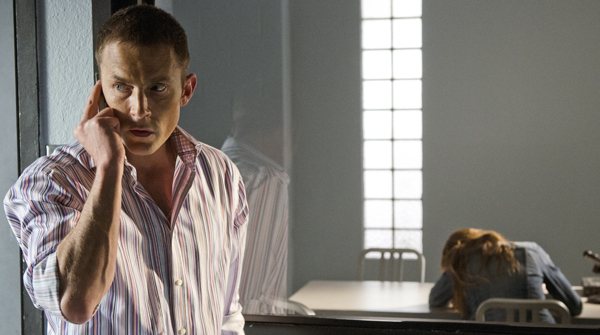 Dexter next decides to pursue Ron Galuzzo, the next potential psychopath on Dr. Vogel’s list of former patients. Dexter finds him working at a mall kiosk. Galuzzo takes some body measurements and recommends some exercise equipment, but Dexter can very clearly tell he’s lying to him. He decides to break in the next day after talking to Dr. Vogel. Regarding Deb’s recent DUI as a reaction to her finding out about Dexter’s dark passenger, Vogel asks why Dexter didn’t kill Deb right there. When creating the code, Harry advocated that Dexter only kill “bad” people, while Vogel thought “don’t get caught” had higher priority. She pushes Dexter to question why he even cares about Deb. I don’t think he’s ever made this face before. When Dexter breaks into Galuzzo’s house, he doesn’t find anything that could indicate that he’s the Brain Surgeon. He finds the house is quite sloppy, except for the kitchen. Why is it so clean? It’s a kill room. For some reason, this disgusts Dexter, more so than I’ve ever seen him before. He realizes Galuzzo would never waste parts of a brain by sending them to Vogel; they’re a delicacy. Galuzzo may not be the Brain Surgeon, but that doesn’t mean Dexter can’t relieve some stress later in the episode by killing him. Lastly, the side arc with Quinn and the Batista’s grows tense. Batista continues to pressure Quinn with taking the Sergeant’s exam, and Jamie criticizes Quinn for his dedication to Deb. It’s accidentally revealed at dinner that Quinn wasn’t in fact called out for a crime scene at 4 a.m., but for getting Deb out of some trouble. I’m pretty sure this relationship won’t last very long, and maybe Quinn and Deb will end up dating again! Who knows? Recap: In an incredibly emotionally charged episode, Dexter rules out one of Dr. Vogel’s former patients as the Brain Surgeon, but finds him a guilty cannibal that very much fits his Code. 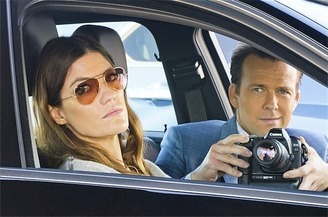 Deb gets brought in for a DUI, but Quinn rescues her, straining his relationship with Jamie Batista. After Dexter trying to convince Deb that she’s a good person, Deb breaks down and decides that she has to confess to police that she killed LaGuerta. Dexter sweeps her away from the station and locks her in her house with Dr. Vogel so they can talk things through. Food for thought: Do you think Quinn believed Deb that she killed LaGuerta? Or will he just let it slide as PTSD/survivor’s guilt per Dr. Vogel’s suggestion? Speculate with me in the comments!